What's in the basket? A question Duane Bradley is asked a lot when he arrives in New York and checks in to the sleazy Hotel Broslin. Who would guess it contains his grotesquely deformed brother Belial?! Separated at birth, the Siamese twins have come looking for revenge on the doctors that left Belial for dead and now the basket-dweller's ready to wreak blood-soaked carnage. Where the original classic ends the sequels pick up and things start to get really warped when the brothers meet their long lost aunt 'Granny Ruth' and her whole houseful of freaks. 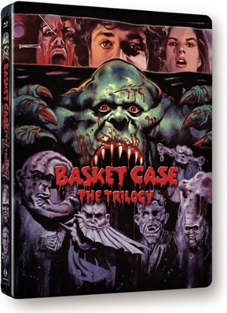 One of the essential repeat rentals for any self-respecting horror fan in the early 80's, Frank Henelotter's cult classic Basket Case and the gloriously psychotic sequels it spawned are collected together here in one of the most twisted and enjoyable horror trilogies ever made. Following the success of their June release of Return of the Living Dead, Second Sight Films are bringing the wonderfully warped Basket Case – The Trilogy to special edition DVD and a limited special edition Blu-ray steelbook on 22nd October 2012 at the RRP of £29.99 for the DVD and £39.99 for the Blu-ray. Interview with Gary Humphries – The legendary film poster artist discusses his career up to the creation of the new 'Basket Case Trilogy' artwork. Photo Gallery – behind the scenes, promotional material, stills.